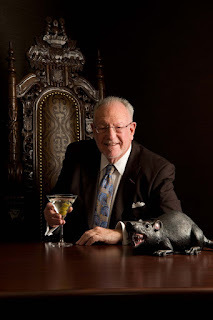 I Love Las Vegas Magazine...BLOG: Spend Time With Legendary Oscar Goodman At Oscar's! Spend Time With Legendary Oscar Goodman At Oscar's! Visit Oscar’s steakhouse at the Plaza Hotel & Casino for Oscar in Oscar’s, Monday, August 7 through Wednesday, August 9 from 4:30 to 6 p.m.
Oscar Goodman will be mingling with guests and telling his favorite tales of being a mob attorney and Mayor of Las Vegas inside the lounge of Oscar’s steakhouse. Goodman will also sign his book, Being Oscar, which is available for sale at the restaurant. Inside Oscar’s dining room, guests can enjoy a $29 dinner special, “What Oscar Eats,” a three course meal that begins with Cardini’s Two-Bit Caesar Salad, followed by a 14 oz. Bone-in Ribeye with Shmuley’s Extraordinary Mac & Cheese, and ends with decadent chocolate ice cream. Oscar at Oscar’s is a casual version of the bimonthly Oscar Goodman Dinner Series that offers guests a three-course plated dinner experience paired with red and white wines as well as the signature Oscar Goodman Martini. The next Oscar Dinner Series will be Thursday, September 14 at 6:30 p.m. with the topic: “Humor in the Middle of Mayhem and Murder.” To attend the next Dinner Series, RSVP and pre-payment of $150 is required by calling 702-386-7227 or email RSVP@playlv.com. Reservations for dinner are recommended and can be made by calling 702-38-OSCAR or 702-386-7227 or online at www.oscarslv.com.